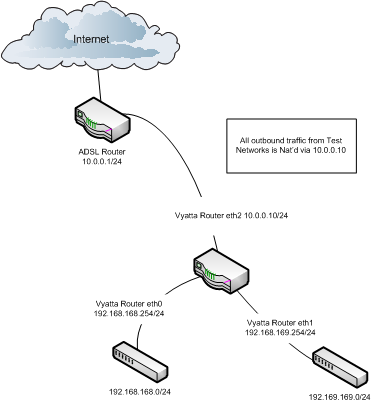 I recently deployed a Vyatta router into a Hyper-V test environment to connect multiple host-only networks and provide Internet access. The deployment was a success and is detailed here. Intially I wondered if the VM was running low on memory; I had assigned only 128MB of RAM, so increased this to 256MB only to expereicne the same issues a few days later. I then came across trhe following forum post http://www.vyatta.org/forum/viewtopic.php?t=6221&sid=a15464ed60549a515c43bca4c26909b7 which described my issue perectly. The solution? Configure the VM to have 2 vCPU’s – ever since the Vyatta virtual router has been stable. Vyatta is a router that can be used in a Hyper-V or ESX Virtual machine and is available for download Vyatta Download. I’ve used this to connect host-only networks in order to create valid test environments, an example configuration is illustarted and detailed below. In order to implement the above configuration on the Vyatta virtual router follow the configuarion steps outlined below. For reference the default username / password is vyatta / vyatta. Ensure that VM has 2 vCPU’s – with a single vCPU the interfaces can become unresponsive as per; http://www.vyatta.org/forum/viewtopic.php?t=6221&sid=a15464ed60549a515c43bca4c26909b7. Under Hyper-V I can confirm this stable with 2 vCPU, 256MB RAM – your mileage may vary. In order to convert a system it must be out of production – i.e. no transactions or processing can take place during the conversion. 2. Use a conversion hub to bridge the required networks and act as the converter. This should be a Windows 2008 R2 VM with a VMXNET3 adapter connected to each network hosting physical machines )enabled on-demand, as required). The server should have RRAS installed as detailed below; this server must have an interface on the management network of the ESXi hosts. ESX/Destination Server – the destination ESX host you wish to virtualise the physical server too. Converter Server – hostname vCONVERTER – Standalone Windows 2008 R2 with IP Routing Capabilities and VMware Converter – use RDP to access. The default gateway on the cold clone should be IP address of the vCONVERTER machine’s interface on the same subnet. 1. Reset the local administrator password on the source server, unless you are 100% sure you know the password. a. For SQL servers: set SQL services manual. 1. Logon to vcCONVERTER using Remote Desktop. 6. Enter the source server name or IP address, authentication details and then click ‘Next.’ You may be prompted to install the VM Conversion agent, proceed; however this may reboot the server. Once installed manually reboot the server. 7. You will then be prompted to select a destination host. Because we have vApps the old converter crashes when you connect to the vCenter – If you do the converter will crash and you will have to start again! 9. You are now able to modify the hardware that the virtual machine will be allocated; click EDIT next to any of the groups (Network etc) to begin the customisation. Firstly configure the NIC VLAN membership; do not create teams etc. Un-tick the ‘Connect at power on’ option. Do not worry about selecting the correct VLAN/Network at this stage, for some reason this is ignored during the conversion process. 10. Now reduce the CPU count to 1 or 2(MAX) depending on function of the server. 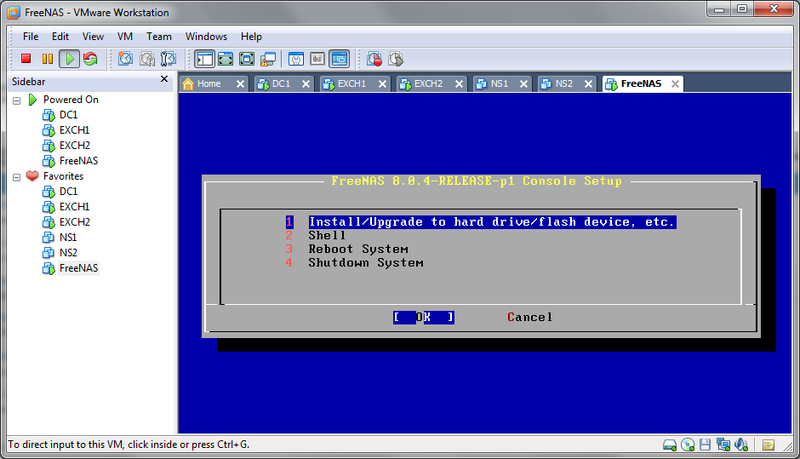 Available during a cold clone only; disks are copied to the destination block by block. If you reduce the size of a volume it will use the Volume-based File-Level method; typically this is around 5-10 times slower. In a trial conversion of a BL35p we saw Volume-based Block-Level run at around 18MB/sec and Volume-based File-Level run at around 100-300KB/sec. Disabling anti-virus, defragging the volume may help to speed up Volume-based File-Level clones. 12. If the server has 2 partitions split these into different vDisks as it will make future growth exercises far easier, click the Add Disk, then click the ‘Move Down’ – do this for each partition. You can, if desired, perform a ‘Thin’ P2V using the option available here under the ‘Type’ column select the drop-down box to change disk format to thin. 15. Review the task you are about to initiate, then click Finish – you may be prompted to reboot the source server, click Yes to reboot – the conversion will start automatically after the reboot. 17. If the physical server was a Windows 2000 server, check that it is not stuck on the ‘It is now safe to turn off your computer’ screen. Physically power it off and remove from the rack/chassis. o For Windows 2000 use E1000. Click Add, select Ethernet Adapter and change the type to VMXNET3. Finally select the desired network to connect to. 22. From Add/Remove Programs remove all HP components except from Data Protector. Once completed reboot the server. You may have to kill a stuck service using task manager if the HP Insight Agents are in a Stopping State, look for cqmgserv.exe. 24. Take a snapshot of the Virtual Machine. 25. Download and run the ‘renewusb_2k.cmd’ (available here: http://cb-net.co.uk/downloads/devcon.zip) script to cleanup hidden/now invalid devices. 26. If server is a HP server download (available here: http://cb-net.co.uk/downloads/HPPSPCleaner.exe). Credits for this tool http://ctxadmtools.musumeci.com.ar/HPPSPCleaner/HPPSPCleanerDownload.html. 29. Delete the snapshot you created earlier. 1. Go to C:\Program files\VMware\VMware Tools . 2. Right-click VMControlPanel.cpl properties and choose Security. 3. Click Advanced and deselect Allow inheritable permissions. 5. Log in as an Administrator. 6. Right-click on the VMware Tools system tray icon. b. Install WindowsServer2003-KB978243-x86-ENU.exe from P2V folder. c. Set /NoExecute=OptIn in the boot.ini file if the Citrix server is x86. f. If you have modified the PageFile and extended the System drive run PageDefrag to create a contagious page file. 1. Access the Windows Registry. Choose Start > Run, then type regedit. The Registry Editor window opens. 3. Right-click ProviderOrder and choose Modify. In the Edit String Value dialog box, edit the value data string and remove the word hgfs, vmhgs, or vmhgfs). o If the value data string contains LanmanWorkstation,hgfs, LanmanWorkstation,vmhgs, or LanmanWorkstation,vmhgfs, change it to LanmanWorkstation. o If the value data string contains only hgfs or vmhgfs, erase it and leave the value data string empty. 5. Close the registry editor. Choose File > Exit. 31. If server is Windows 2003+ use Network Load Balancer MMC tool to re-add host, for Windows 2000 manually reconfigure the host. Including adding the secondary IP address to the host. 32. If server is a Windows 2003 server power off VM and configure Hardware Instruction Set and MMU virtualisation. Under the properties of the VM select the ‘options’ tab, then select CPU/MMU Virtualisation options. Select the value to suit your environment. ESXi uses a scratch partition to store logs files; when a server is restarted/rebooted logs will be lost. Using vMA it is possible to ship logs to another server in order to preserve them for troubleshooting purposes. I have selected the latter because I have then determined VM HA requirements on a per-VM basis on the cluster (shown later).